Ten Speed Press, 9781524758981, 288pp. Featured as one of the best and most anticipated fall cookbooks by the New York Times, Eater, Epicurious, The Kitchn, Kitchen Arts & Letters, Delish, Mercury News, Sweet Paul, and PopSugar. KRISTEN MIGLORE is the creative director at Food52.com. She abandoned a career in economics in 2007 to pursue a master's degree in food studies from New York University and a culinary degree from the Institute of Culinary Education. Her writing has since been published in The Wall Street Journal, Saveur, and The Atlantic, and she was nominated for a James Beard Award for Food52’s Genius Recipes column in 2014. The column led to the Genius Recipes cookbook in 2015, which won an IACP award in 2016 and became a New York Times best seller. She lives in Brooklyn and usually has a pastry in her purse. FOOD52 is a groundbreaking online kitchen and home destination. Founded by Amanda Hesser and Merrill Stubbs--two authors and opinionated home cooks who formerly worked for the New York Times--the company celebrates home cooks, giving them everything they need in one place. That includes smart and entertaining stories about cooking and home, over 70,000 recipes, a cooking hotline, a suite of cookbooks, a shop with everything from stunning tabletop goods to the trustiest pan, and a million-strong community of fellow talented and curious cooks. "For the baker looking for a sure thing with every turn of the page ..."
"Food52’s creative director Miglore delivers a solid collection of proven, must-have recipes for an array of desserts. The recipes are sourced from such expert bakers as Rose Levy Beranbaum and Stella Parks, and such chefs as J. Kenji López-Alt and then tested in the Food52 kitchens. The result is a cookbook that will become a go-to for enthusiastic bakers." "It functions like a treasure hunt, with lovely things casually lurking within the pages … smart, delicious, understated and, yes, genius." "True to the name, the latest sweets-focused book in Food52’s Genius Recipes series is a collection of gems." 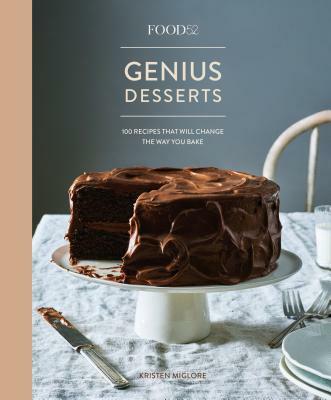 "Consider this the indispensable baking guide, filled with all the clever hacks... you’ve been searching for."